Bahamas. Carmel. Aspen. From swoon-worthy seaside paradises to majestic mountaintop mansions, the latest $10 million+ listings from the Coldwell Banker Global Luxury® program captivate with privacy, stunning views and unique architecture. Located in the exclusive “Narrows” section of Harbour Island, this spectacular beachfront compound invites you to unwind, relax and escape. “Reef Point” is perched on an elevated 4-acre parcel with 280-feet on the coveted Pink Sand Beach. The estate comprises three main homes and multiple cottages with a total of 12 bedrooms. Two of the main homes sit directly on the beach and feature two bedrooms each. 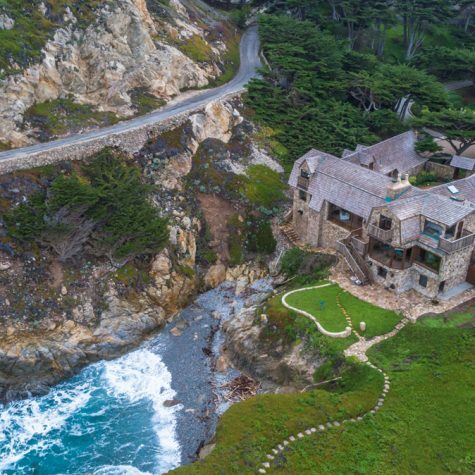 The third home is perched on a scenic hill nestled among impeccably manicured grounds and featuring panoramic ocean views and features three bedrooms. The three cottages have a total of five bedrooms. In addition to the cottages, there is a 2-story beachfront structure presently used as an office and TV room with two baths that can be easily converted into two additional bedrooms. The highlight of “Reef Point” is the incredible layout with an open floor plan, fireplace, cathedral ceilings, gourmet kitchen, beautiful wood accents, a plunge pool and two covered patios with large sliding doors. The master suite has rollaway doors and an outdoor tub. A two-car garage, two swimming pools, two automatic generators a private electric gated entrance are all a part of the compound. The beach is at your doorstep. 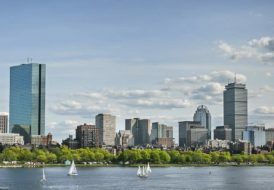 Nearly half of the property has been left undeveloped, leaving ample room for further development. 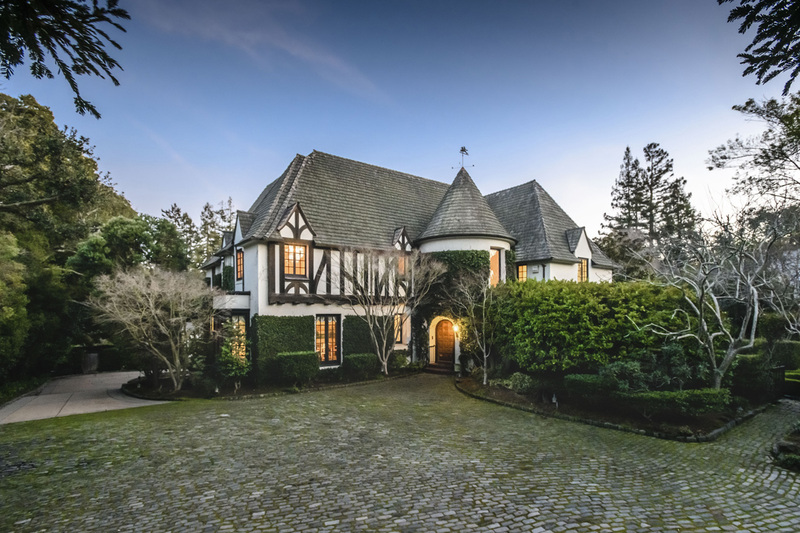 Located on one of Lower North Hillsborough’s most coveted streets, this Tudor-style home features classic architecture and fairytale grounds. Inside, original details present itself in a carved stone fireplace, French doors, antique wallpaper and Venetian plastered walls. This spacious home has an expansive kitchen with French cabinets and a gloriously sunny dining area with a wood burning fireplace. Multiple rooms in the house open up to the outdoors, making indoor-outdoor living natural. The remodeled master suite overlooks the grounds and features dressing chambers inside a spa-like bathroom featuring a unique shower in the round. Formal living and dining rooms, multiple family rooms, a library, office, multiple bedrooms with en-suite baths and adjacent lounge areas offer a variety of spaces for a family to spread out or come together. The home sits on one of Hillsborough’s most desired and convenient streets, close to North and Crocker School, and downtown Burlingame. 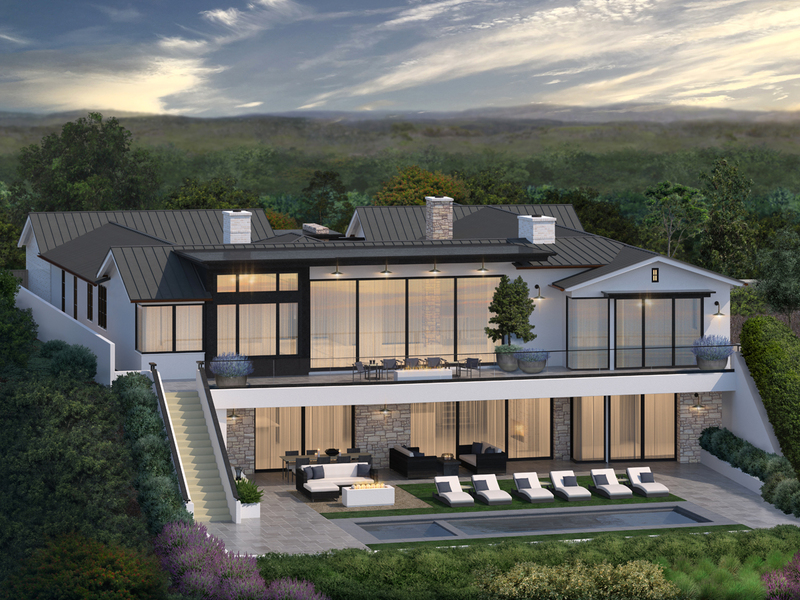 This stunning 7,500-square-foot new-construction custom estate on the prestigious front row of Irvine Terrace was designed by William Guidero and will be built to perfection by Devco Homes. 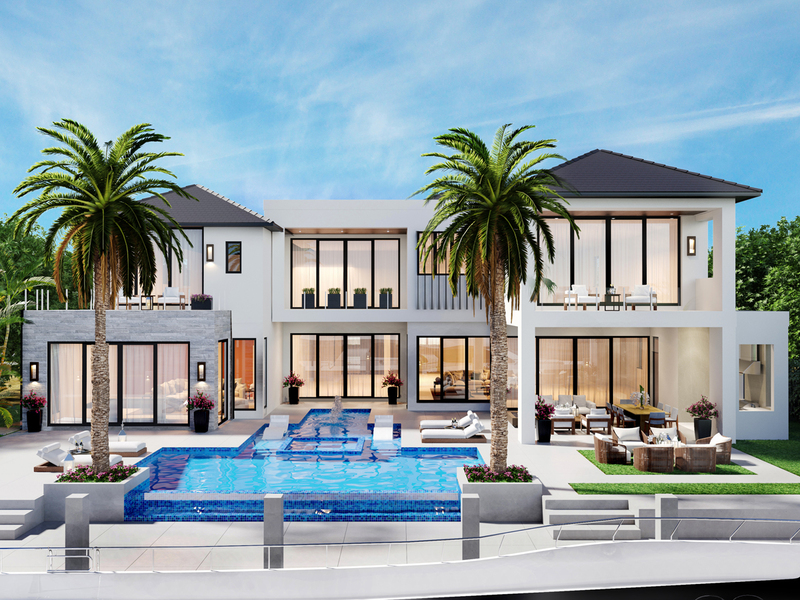 Slated for completion in 2020, the five-bedroom, eight-bath home’s modern farmhouse-inspired residence delivers sweeping beach, channel, sunset and city light views. Upon entry, one is welcomed by panoramic views and main level common areas including a luxurious great room, chef’s kitchen with walk-in and butler’s pantries, dining room with fireplace, and expansive view deck with gas-burning fire pit beyond slide-away glass pocket doors. Four spacious en suite bedrooms grace the top-level, including a separate maid’s quarters with private entrance and the master suite with deck access, dual walk-in closets and lavish master bath. By way of an elevator or floating staircase, the lower level wows with an entertaining space featuring a bar, wine room, game room and bonus room that opens to the backyard with pool/ spa, BBQ, and fire pit. A gym, office, guest suite, abundant storage, a rare 4-car garage and an oversized lot are additional highlights. Located in the heart of the Newport Beach and Corona Del Mar area, with all-access to the Village, Fashion Island, and airport, this distinctive property raises the bar for exquisite coastal living. “Sophisticated mountain estate with spectacular views” sums up this rare Aspen architectural find. Located on 1.6 acres at the end of a cul-de-sac, the 7,797 square-foot residence presents a fusion of privacy, natural beauty and a floorplan meant for entertaining and family living. Refined interiors by Richard Mullins and architecture by David Johnston pay homage to the warm mountain contemporary style that captures the best of the Aspen lifestyle. Multiple living areas offer flexibility for those with large extended families. Five bedrooms, six full baths and two half baths offer comfort and space. Other perks include a wine room, outdoor hot tub, snowmelt driveway and patios, two-car garage and much more. The location is second to none, with direct ski-out access to Fivetrees/AVSC private lift to Aspen Highlands. 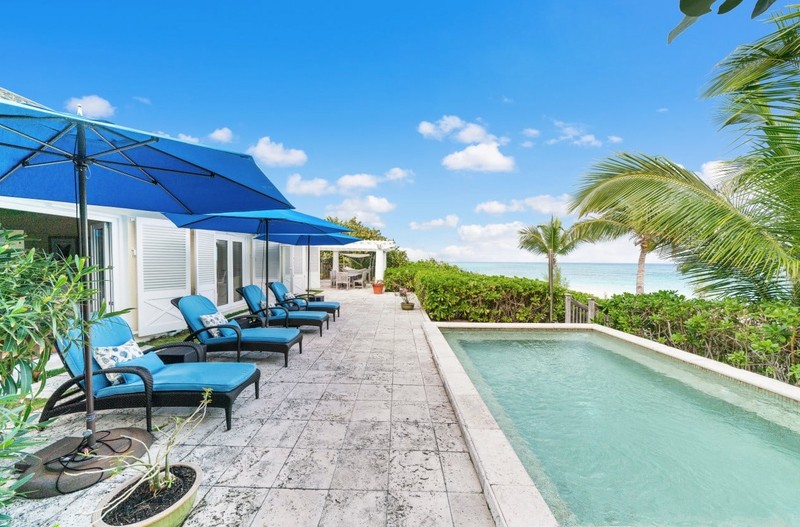 With its spectacular setting on an ocean view promontory of nearly one acre, this contemporary coastal estate was inspired by luxury five-star island resorts. Completed with impressive detail, this truly magnificent home encompasses approximately 10,200 square feet of living space. The serene tropical ambiance moves seamlessly to outdoor spaces with virtually every room offering panoramic ocean and canyon views. The open indoor/outdoor floor plan features grand living areas, chef-grade kitchen plus caterer’s kitchen, professional recording studio, wine room, tasting room, dramatic high ceilings and sculptural staircase of glass and Walnut. The entire home is showcased with custom designer details including light fixtures, imported European Oak, Walnut and stone. 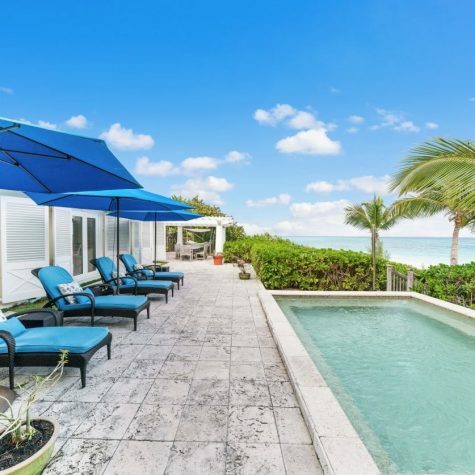 Outdoor amenities including a custom saltwater pool with swim-up bar, 10-person spa, large entertaining cabana, and pool house with shower/steam room make this the ultimate entertaining compound. 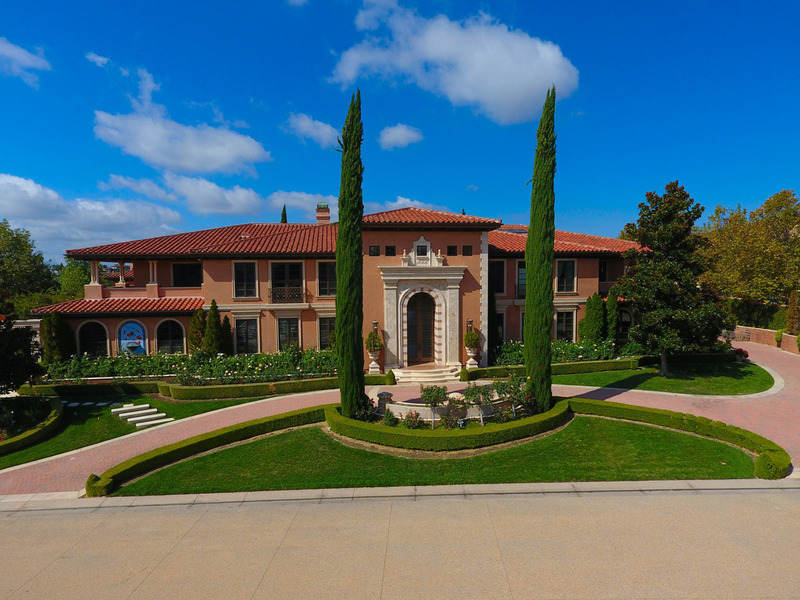 Balinese-inspired landscaping and a private gated entry and drive lead to the 10-car garage with a turn-around to accommodate eight additional vehicles. This is Laguna Beach luxury at its very best. 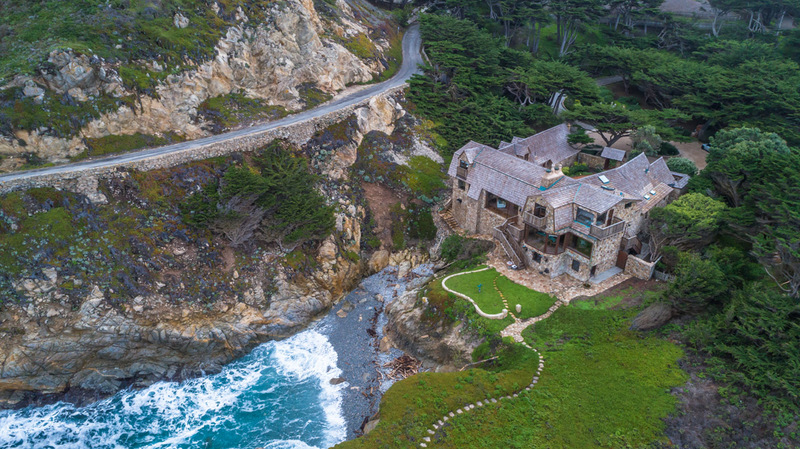 On Carmel Highlands’ renown Spindrift Drive, this oceanfront residence nestled in a private rocky cove showcases breathtaking views of the rugged Carmel Highlands coastline. The dramatic high-ceiling living room enjoys intimate views of the surf crashing on the rocks below. A main floor master suite features a stunning spa/bath with marble vanity, exotic stone and a window to a private enclosed patio with water feature. The upstairs master suite with adjoining office boasts sweeping ocean views. There is a private interior courtyard offering options for sunny sheltered outdoor living, and a meandering trail leads to an oceanfront knoll with fresh ocean breezes, evoking the feeling of being on the bow of a ship. “Home is the Sailor. . . Home from the Sea” is carved above the fireplace and embodies the essence of this coastal enclave. This massive mansion in Calabasas’ ultra-private community, The Oaks, impresses with extraordinary details, grand entertaining spaces and a prime east-to-west position that allows for incredible sunsets and panoramic views of Las Virgenes Mountains, which merge in the most dramatic fashion with the backyard’s infinity edge pool. 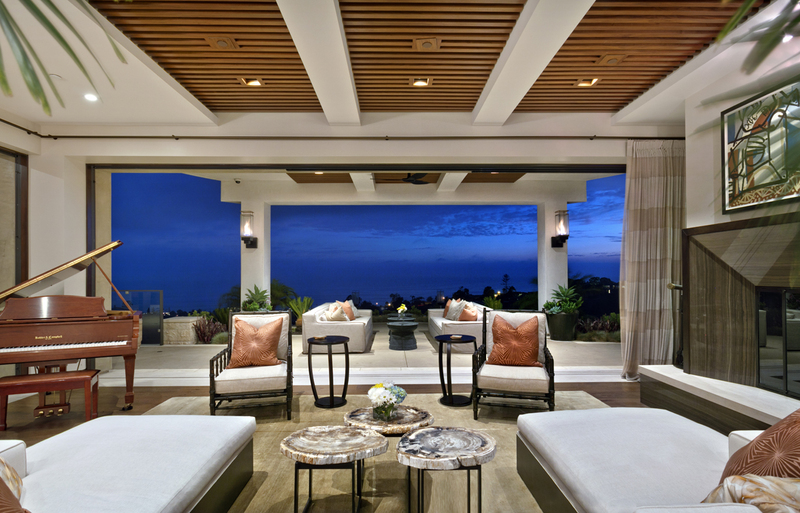 Developed by architect Dan Lang, the custom build spans approximately 15,000 square feet, with an added 3,000 square feet of outdoor patios and pavilions. 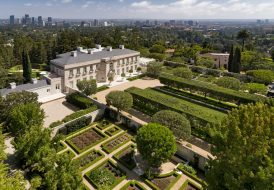 The residence is teeming with top-of-the-line luxury details, including crystal Swarovski chandeliers, Phylrich plumbing fixtures, 24-carat gold fixtures, ornate THG Paris faucets, five fireplaces and hand-cut 24-inch marble floors. The scale and detail is captured in every room, beginning with the amazing double staircase greeting you as soon as you walk inside. The master suite represents the pinnacle of luxury, as it is outfitted with walk-in closets, a wood panel customized library, spa tub, steam shower touched with hand paintings by Kavalry and multiple balconies. 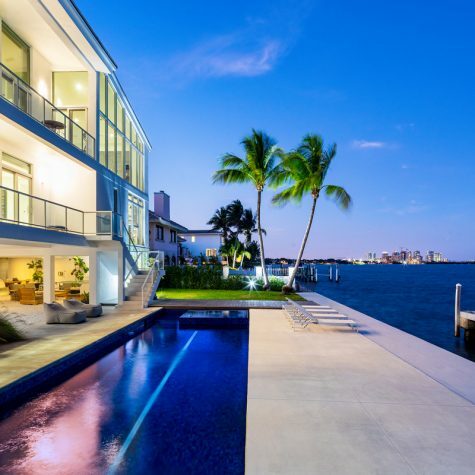 This stunning contemporary tri-level residence located in the desired gated Sunrise neighborhood sits directly facing Biscayne Bay with sweeping unobstructed open bay, downtown skyline and Key Biscayne views. The residence boasts five bedrooms, plus a gym and 6.5 baths. A masterfully designed open floor plan provides the ideal canvas to showcase extraordinary attention to detail, such as stone floors and soaring ceilings. An interior elevator can take you up to the amazing third level featuring a spacious living room with a private dining room and custom-designed gourmet kitchen by Alno with Miele appliances. A beautiful bay-facing master suite offers terrace access, a Carrera marble master bath, custom closet spaces and open bay views. 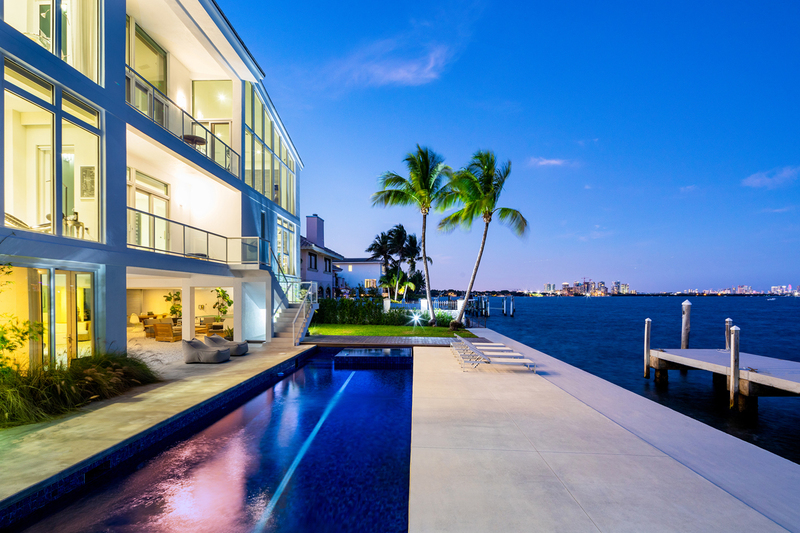 Outdoor highlights feature a covered lounge area, large pool with Jacuzzi, private dock with boat lift and 100 feet of sparkling waterfront in Miami’s most prime location. A dual 500 tank mega generator rounds out the many thoughtful touches incorporated into this home. This remarkable “Museum Modern” estate rests on an approximately 200-foot long gated driveway on nearly an acre lot in prime Trousdale Estates. Perched on a knoll above Loma Vista Drive and overlooking the city with serene canyon and vibrant sunset views, the property offers a completely private and tranquil setting seemingly away from it all, yet still close to city amenities. Despite the estate being brand new construction (just completed in 2017), the home truly embodies the spirit of the “Rat Pack” as the site of Dean Martin’s former residence. It was truly designed for glamorous entertaining and celebrating a life of luxury, both inside and out. With over 10,000 square feet of living space controlled by a Crestron home automation system, the estate offers incredible European quality and epic scale with 12-foot ceilings, open spaces, wide hallways and walls of glass that disappear, seamlessly blurring the lines between indoor and outdoor space. There is an impressive great room, state-of-the-art kitchen, full-size theater, gym, office, massage room/spa and more. The exterior spaces are equally alluring with outdoor kitchen featuring a BBQ, bar, pool and spa. 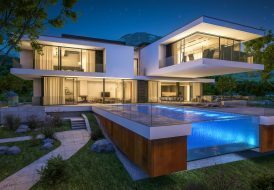 Designed by Randall Stofft, this extraordinary new-build 10,696 square-foot modern estate sits on a 15,750 square-foot lot with 105 feet of waterfront. Built by Trilogy Construction with construction completion scheduled for end of 2019, this waterfront home marries a modern aesthetic with organic finishes, producing a unique property that exudes elegance and warmth. A floating washed oak and glass staircase punctuates the luxurious living of the home. The expansive 10,696 square-foot estate boasts six bedrooms, eight full baths and two half-baths. Features include a lavish master suite with a private waterfront balcony, clubroom with luxuriously appointed wet bar, elevator, home theater, walk-in temp-controlled wine room and indoor pet grooming area. Miele appliances and custom cabinetry in the chef’s kitchen complete the enduring luxury found inside this home.